Some time ago, a little bird told me about some good Yemeni she had on Steinway, and of course a point was made to visit the spot, called Aden. Aden seems to have evaporated for one reason or another, but the place is exactly the same. 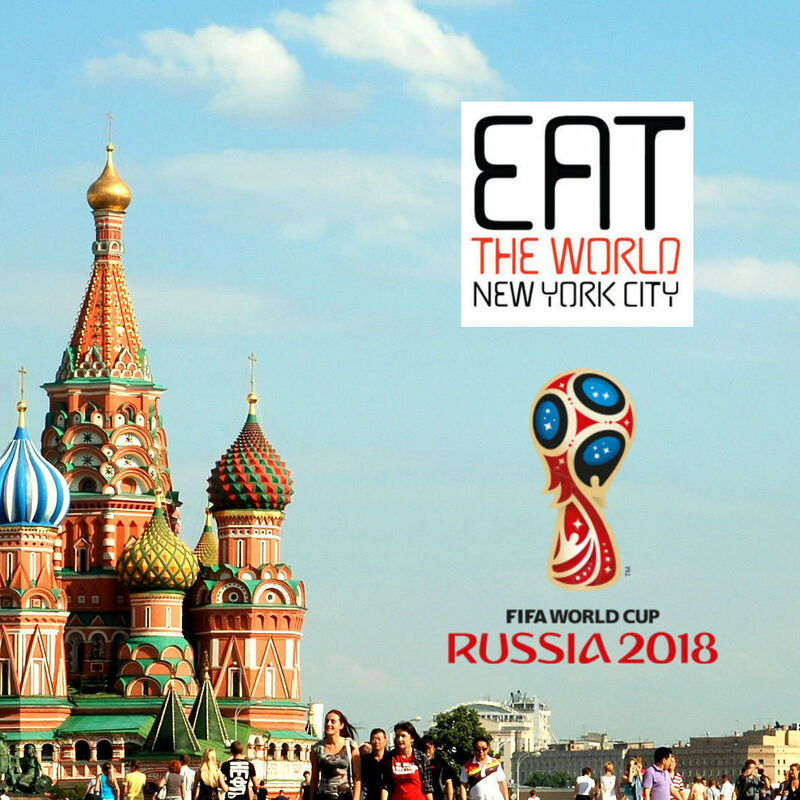 It seems they even reused the graphic they sent to the banner shop by just replacing the text of the name, and thus another four letter restaurant title was created. Inside the booths and decor are unchanged, and the word Aden even shows up at the bottom of one of their menu pages. If you go here and decide to investigate, let me know what you find. In the meantime, good food is still served, and our group of four was quite pleased with the meal cooked on the very cold night we went. 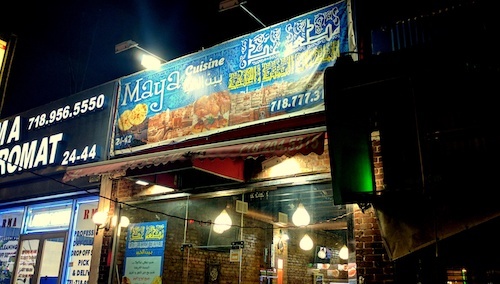 Maya has opened a standard-looking halal cart directly in front of the shop that seems to do a brisk business. As we were beginning our meal around 7pm, the cart seemed to be setting up, with ingredients coming from the kitchen. With Astoria's large taxi populations, it would not surprise me to see this open for the better part of the night. Before the orders start coming, each diner is presented with a bowl of soup called maraq and a small salad. Fresh lemons are also brought to squeeze in the soup as desired. 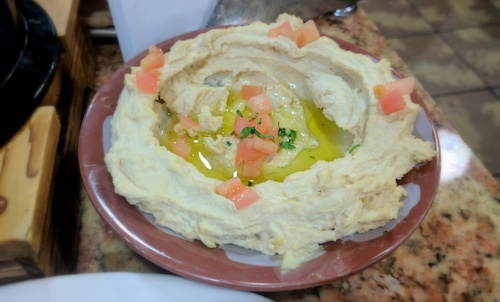 If there was one low point of the meal, it was definitely the hummus ($7, below), which might have been good but was obviously made yesterday. Unused, it was stuck in the fridge and arrived at our table almost unbreakable. We needed spoons rather than bread to scoop it. 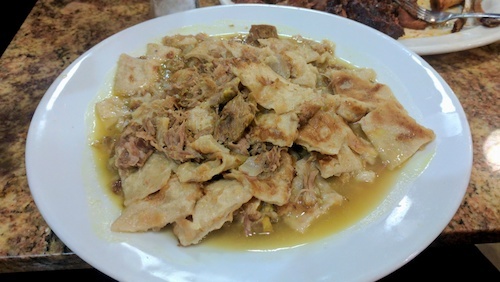 It is hard to eat a Yemeni meal without ordering the saltah ($20, below), the national dish of the country. The main clay pot is always slightly different based on the chef's recipe. The version here comes much redder than usual without a whipped fenugreek top, but full of ground lamb, root vegetables, chilis, and tomatoes. Two large pieces of clay oven bread come with it, and should be used as vehicles for the still boiling stew. Be careful. 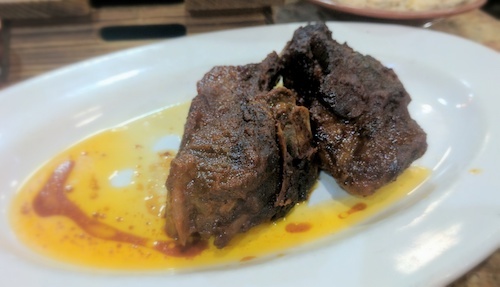 Saltah is usually served with haneeth, tender lamb that melts off the bone. As we shredded the pieces below, there were almost oohs and ahhs as it came apart so easily. The marinade is perfect, the meat slightly gamey reminding you it actually is lamb. Recommended. 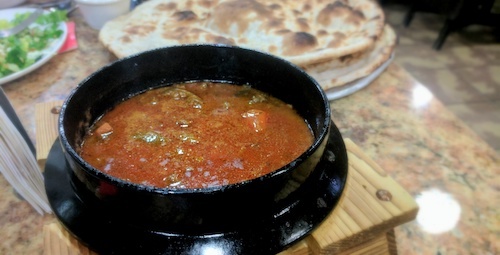 The last Yemeni restaurant we went to served a delicious fattah b'lahm ($18, below), so it was anxiously ordered here as well. The menu describes the bread as Yemeni croutons, and more lamb is combined with a wonderful gravy to remind us all of Thanksgiving stuffing. The large pieces soaked up a lot of gravy but there was still plenty on the plate, making this a very wet dish. 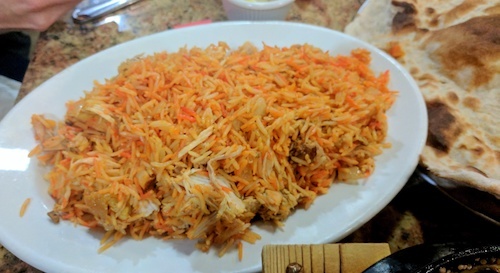 After trying kabsa in Paterson, New Jersey, I was ecstatic to find it on the menu here. Available in chicken and lamb, we opted for chicken to balance our otherwise lamb-heavy meal. The kabsah ($15, below, added "h" theirs) here is yellow rice with spices, small pieces of roasted chicken mixed within. Unlike its counterpart in New Jersey, this dish seemed a bit dry and unexciting. The others at the table liked the dish, and I suppose I would have too if I had not been so blown away by the first rendition. On this very cold December night, they did not seem to be too worried about the heat levels in the place. The waiter wore a stocking cap, and we could barely remove our winter coats. I am not sure what their thoughts were about diners, as it basically remained empty except for one lone man who ate fast. The people were friendly, I just don't think they see diners as priority. Apart from not really understanding that, and intent on the good meal anyways, we certainly had a good time.